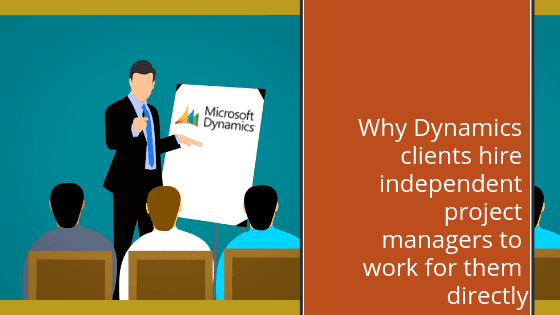 More and more Microsoft Dynamics End Users hire Consultants to manage their ERP or CRM implementation. This happens regardless of whether or not they have a partner deploying the solution. So what is the rationale behind it? – They hire someone with Dynamics ERP or CRM experience that they are unlikely to have in-house. This position is often interim so no need to hire a permanent employee. – This person is considered as part of the team: they would understand the organisation, the politics, and the key influencers better than a partner; he/she should know how to get the right internal resources to get the job done. – Their sole focus is to get the project on time and on budget and they are managed by end-user. – This resource is in charge of the partner and Microsoft coordination so the company doesn’t have to distract other execs from their day-to-day responsibilities. – This demonstrates massive commitment to the project and therefore the success rate would be much higher. – They get the right people to take part in the implementation during the various phases. – The client project manager can help escalate any issues or problems up the client exec chain. These people are their advocates at the customer site. – This resource shares the same ultimate goal, to help the partner deploy the solution in time and on budget.